[WLF] has evolved into unifying riders around the globe with the common passion of two wheels and a throttle. Pro-files features hand selected riders that produce some of the best Offroad, Dualsport, Enduro & ADV content available. Get all the latest news and updates and event information sent directly to your inbox. You'll need to confirm via email verification to be added to the [WLF] Email list. Thank you! 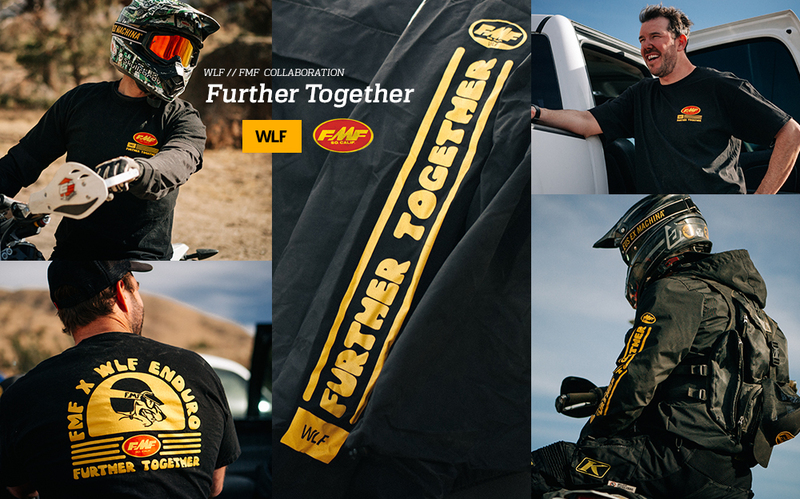 WLF Enduro's mantra is "Further Together”. It’s more than just words on paper. Its the whole pack’s mentality. No matter if they are dragging each other out of tight spots, fixing flats, or getting lost to get found they go Further Together…Its gotten them here, there and everywhere in between. Riding on two wheels is a family no matter what year, make or model you're on. We all start and work together to finish in the same spot. We at Flying Machine Factory share this same passion and is why we got into the business 45 years ago. Some things have changed but one thing will remain, throwing a leg over a dirtbike and enjoying the smile they put on our faces. This is why we have joined WLF to bring this LIMITED EDITION apparel collection and go Further Together. We are of humble beginnings from the hills and deserts of Southern California. Some of us have been riding and racing dirt bikes from birth, others of us picked up the sport later in life. What started as a handful of rag-tag teachers, salesmen and construction workers has turned into a team of riders connected around the globe. From DualSport/ADV bikes to technical Off-Road, Enduro riding, we love it all. We are brought together by moto-comradery and the passion of exploring on two wheels. Giving back to the community is one of our key pillars at [WLF]. We're very fortunate to be able to enjoy this amazing sport. We strive to partner with charity organizations and events to help those in need. Thanks for visiting the [WLF] Shop. Have a look around. Let us know if you have any product or sizing questions.